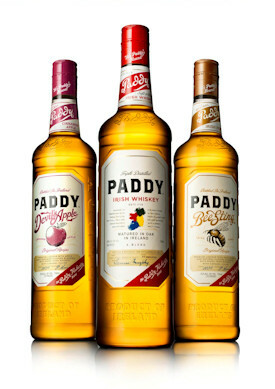 Irish Distillers Pernod Ricard, the world’s leading Irish whiskey producer, has given its iconic PADDY Irish Whiskey a packaging makeover and announced the release of two new PADDY flavour variants aimed at bringing sociable millennial consumers to the Irish whiskey category. An eye-catching new bottle for the core PADDY expression – Irish Distillers’ special three-whiskey blend of pot still whiskey, grain whiskey and malt whiskey – features new tactile embossing features to the sides of the bottle while the famous multi-coloured map of Ireland on the label is retained. Also new is a heritage endorsement flashing The Paddy Flaherty Brand in homage to the man from whom the brand takes its very name, a ‘Soft & Mellow’ liquid taste profile on the neck, while a new signature of approval from original founder James Murphy demonstrates the rich history and crafted credentials of the brand. The new PADDY flavour variants have been created with a lighter flavour profile which, coupled with a distinctive bottle design and impactful marketing campaign, aim to challenge many of the traditional perceptions of whiskey. An integrated campaign, ‘Sleep When You’re 30’, will be activated initially in the USA through a new website - www.paddywhiskey.com - plus a social media campaign, drinks strategy and advertising to reinforce the brand’s image of “Irish craic”, the Irish word for enjoyment.